It is always fun to play a part in a wedding gown restoration when our customer is the husband. Ah, some men really are very sentimental! Donald sent his wife’s wedding gown, slip and veil to be restored and preserved. All pieces had yellowed and there were a number of rust colored stains on the wedding dress and slip, as well as an oxidized spill on the front of the bodice. Unfortunately there some some mold and insect damage on the wedding gown, and a shoulder seam was in need of repair. 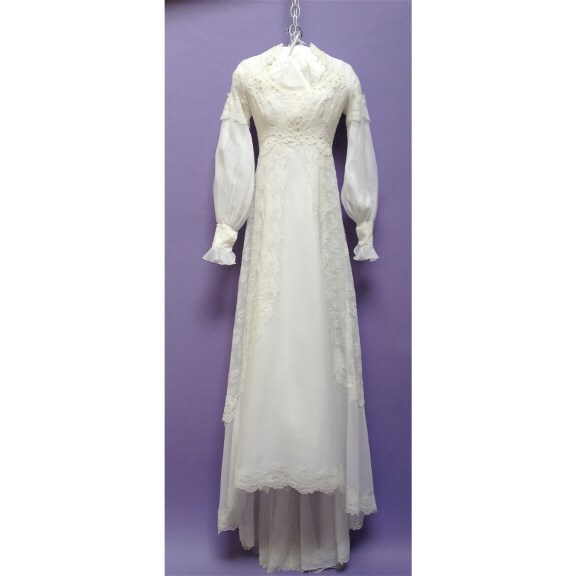 For this wedding gown restoration we cleaned and chemically whitened the veil, slip and wedding dress. 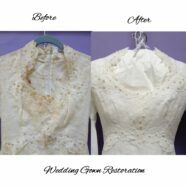 The wedding dress needed a second treatment, as the discoloration was quite dark and the first treatment didn’t quite take care of it. The shoulder seam was repaired, along with some holes in the lace. We also replaced some missing pearls on the bodice. All pieces were pressed and preserved. The dress turned out beautifully.